In 2010, A Walk in Their Shoes featured another story of living history. This time the group presented a speaker whose family story became the essence of the major motion picture, Defiance. Zvi Bielski, son of Zus Bielski, told how the three Bielski Brothers saved over 1,200 Jews from extermination by hiding them in the forests of Belarus. Zvi Bielski shared his family’s incredible story of transforming persecution and violence into affirmation and survival to over 1,000 students in the Marathon County. During the darkest days of World War II, Zvi’s father and uncles rescued 1,250 Jewish men, women, and children, whose offspring today number close to 20,000 souls—the largest rescue of Jews by Jews in WWII. 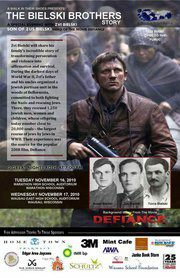 Their experience was the inspiration for the book The Bielski Brothers by author Peter Duffy and the popular 2008 film, Defiance.